Our office is located in the Nanjing International Expo Center, Jianye District. You will find us in the 2. Floor of Hall 3B. The access is West Bailongjiang Street, which passes under Hall 3, but is not open to cars. Arrival by Taxi/Car: Get off at Gate 11 on Yanshan Road or Gate 3 on Jiangdong Middle Road, then reach us with just a few steps. The underground parking garage is accessible through Gate 12 on Yanshan Road. 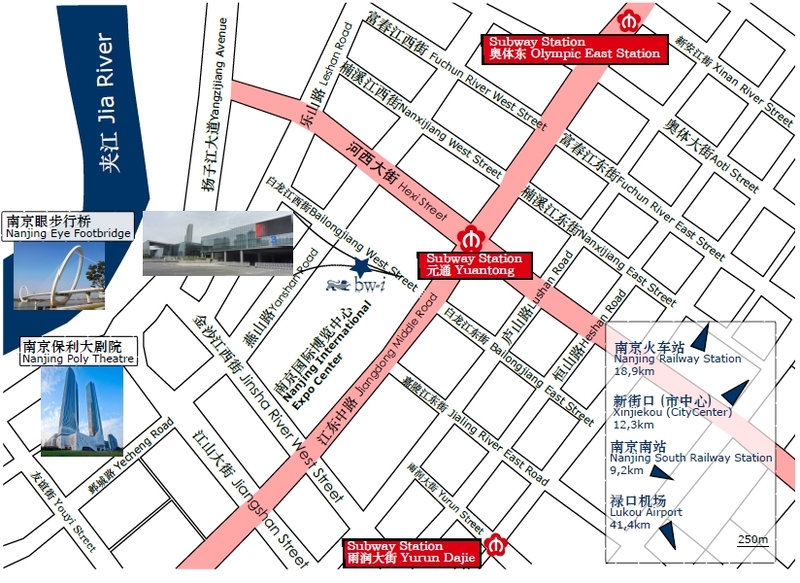 Arrival by metro: The nearest metro station is “Yuantong” and it is only about 5 minutes’ walk from there to our office. After arriving at Yuantong, please leave the station through “Exit 4”. Then walk along the street until you come to a T-junction with the road sign "Bailong Jiang West Street" as well as a large stone with red Chinese characters of "Nanjing International Expo Center". Turn right and enter into the exhibition centre through Gate 3. Our office is located on the left side of the corridor between hall 3B and 3A. Arrival by train: “Nanjing South Railway Station” is approximately 11 km away from our office. You can take the metro Line 1 to "An De Men" station and then transfer to Line 10 to "Yuan Tong". Arrival by plane: “Nanjing Lukou International” is approximately 47 km away from our office. From there you can take the metro Line S1 to “Nanjing South Railway Station” and then take the Line S3 to “You Fang Qiao”. Then transfer to Line 2 to “Yuan Tong”.